The American open-wheel car racing event popularly known as the Indy car racing event is a male-dominated, risky and highly competitive sports, yet there is one woman who beat all odds to emerge the first to win an Indy car racing tournament back in 2008 in Indy Japan 300. Danica Patrick is the celebrated Indy car driver, she is a gorgeous combination of beauty and courage who through hard work, enshrined her name as one of the most successful women in car racing. Danica Patrick was named Rookie of the year 2005 both in Indianapolis 500 and in the 2005 Indy Car racing season. She began competitive auto racing as a kid then left schooling as a teenager with her parents’ consent to pursue a racing career in car racing. This saw her travel to England to race in the Formula Fords where she came second and set a record as the best American to participate in the European event. This article gives you an insight into the life of this gorgeous female auto racer including knowing her age, net worth, and who her boyfriend or husband is. She was born and named Danica Sue Patrick on March 25, 1982, in Beloit, Wisconsin, the United States to Terry Joseph Patrick Jr, a former snowmobile auto car racer and Beverly Ann an auto mechanic. Her parents also owned a plate glass company. Danica has a younger sister named Brooke who is a pediatric physiotherapist. Her passion for racing was ignited in 1992 at the age of 10 when she began go-karting with her younger sibling in Wisconsin. Danica attended Hononegah Community High School where she was a cheerleader for the schools’ sports team but withdrew from junior high in 1998 with a General Education Development (GED) certification to enable her focus more on her auto racing career. Both her parents who coached and mentored her over time consented her decision to leave school. After abandoning all academic pursuits in 1998, Danica moved to England at the age of 16 where she competed in Formula Ford and Formula Vauxhall for three years. She was placed second in Britain’s Formula Ford Festival, the highest finish by an American in the event. Patrick during this time met former winning Indy 500 team owner, John Mecom Jr. who took interest in her career and arranged for her to participate in the Formula Fords in the United Kingdom. She returned to the United States in 2001 and in 2002 signed with Rahal Letterman Racing where she showed determination in finishing every race she participated in though not winning any. Patrick entered the 2005 Indianapolis 500 race as the fourth woman to ever participate in the tournament and she placed fourth. This was the highest ever to be achieved by any female driver in the history of the competition. Furthermore, Danica Patrick bested the former record of ninth set by Janet Guthrie in 1978, and she has also stayed in the lead for 19 laps to become the first female driver to ever lead in the Indy 500. She won her first pole position the same year and became the second woman in the Indy Racing League to accomplish this and earned the 2005 Rookie of the Year title. Patrick’s team pulled out of the 2006 Toyota Indy 300 after her teammate Paul Dana lost his life in a training session the morning of the event. She, however, went on to add 10 finishes to her racing campaign that year finishing ninth position in the standings, a performance which earned her the Female Athlete of the Year award by the United States Sports Academy. Patrick registered her name in the history of auto racing in 2008 when she won her first Indy Car Race in 2008 becoming the first female to ever win the tournament, she came third in 2009 and set a record 29th consecutive race running finish in August 2010. Danica Patrick by 2010, entered the ARCA Racing series, transitioning from open-wheel car racing to stock car racing. Though she struggled in most part of her career in stock car racing, she was able to achieve an eleventh-place finish at the Texas Motor Speedway. In 2013, Danica Patrick had her first full season on the NASCAR Sprint Cup series where she won the time trials and became the first woman to achieve this. She was placed eight at the end of the race and again became the highest-ranking woman in the history of Daytona 500 to attain that feat. However, whatever that has a beginning will definitely have an end, Danica in November 2017 announced she would retire from auto racing after competing in the Daytona 500 and Indianapolis 500 in 2018. She has since ventured into modeling and media advertising. As an entrepreneur, she owns her own brand of wine called Somnium. Danica has been an active auto racer most of her life and a very successful one at that. She also earns from contracts, TV show appearances, and personal businesses. Her net worth is pegged at $60 million. Is She Dating a Boyfriend or Has a Husband She is Married to? Danica Patrick married Paul Edward Hospenthal in 2005. The marriage lasted eight years but they split up in January 2013 when she filed for a divorce. At the time of her divorce, the female auto racer revealed that she had begun dating Ricky Stenhouse Jr., a fellow stock car racer who she later broke up with in 2017. Their split came as a result of the inability of Ricky Stenhouse to propose marriage to her. 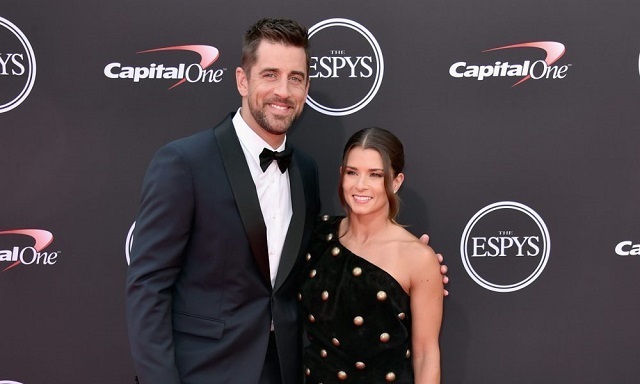 Danica Patrick is presently romantically linked with NFL quarterback Aaron Rogers; the pair got together since February 2018, we wish them both the best and hope to hear their wedding bells ringing soon. Read Also: Jeff Gordon Biography, Net Worth, Cars, Wife, Age, Height, Is He Gay? The gorgeous female auto racer stands at a height of 5 ft (1.57 m) while her weight is reported to be about 45 kg (99.2 lbs). Being that she had a career as a race car driver, Danica Patrick must have committed to having regular exercises as well as eating right to keep her body and mind in top form.